The major labels are acting funny lately, and it’s beginning to smell fishy. Warner is once again trying to buy EMI, Lala.com’s free streaming service (which offered mostly tracks from Warner) died of mysterious causes, and Universal appears to be backing away from iTunes. It all comes back to Steve Jobs in one way or another, and his legendary — and increasingly troubling — influence over the digital music business. In fact, the only person on the planet with more raw power than Steve Jobs may very well be Chuck Norris. Not long after Steve’s open letter to the recording industry essentially requesting that the major labels offer DRM-free music, it actually came to pass. The ensuing battle with EMI over the pricing structure of the unprotected tracks resulted in Jobs capitulating by selling the new tracks for 30 cents more than the old protected ones–albeit he justified it by encoding them at a higher bit rate. Not a bad Jedi mind trick, eh? In fact, the pricing of tracks on iTunes has been a thorny issue between Jobs and the major labels for quite some time. This new business about Universal Music Group not renewing its annual contract with Apple to sell music through the iTunes Music Store smacks of the same old issue. Universal basically wants to sell music a la carte to Apple for resale at the iTMS so it can try to create different pricing structures. But Universal better watch out. 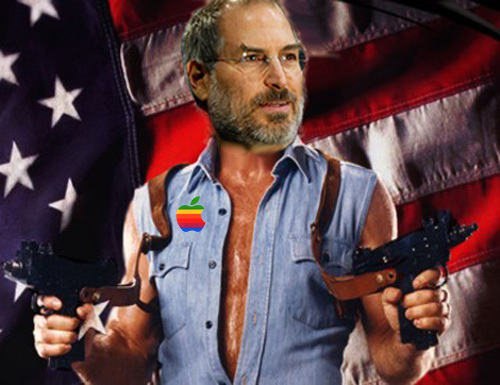 Steve Jobs may not have the roundhouse kicking power of Chuck Norris, but he is certainly a force to be reckoned with. * Steve Jobs doesn’t wear black turtlenecks and blue jeans, he secretes them from his pores each morning. * When Steve Jobs gives a keynote speech, he makes the entire Internet reconfigure itself to handle the blogging traffic. * OS X isn’t based on Unix, it’s based on Steve Jobs’ DNA. * Steve Jobs doesn’t need eyes. He sees everything he needs to see through the iSight cameras built into newer Macs. * Steve Wozniak isn’t real. He’s just an astral projection of Steve Jobs’ bigger, nerdier alter ego. * Steve Jobs knows exactly how many licks it takes to get to the center of a Tootsie Roll pop. * When Steve Jobs sneezes, tiny ones and zeroes are expelled, which assemble themselves into OS X widgets. * Steve Jobs doesn’t need a computer to load his iPod; he interfaces with it directly using his right index finger. * Steve Jobs can change the weather by writing an open letter to the sky. So if the major labels know what’s good for them, they’ll continue to let Jobs set the pricing structure for digital music. It doesn’t really make sense for them to do so much complaining, given that selling digital music cheaply (relative to the exorbitant prices for the soon-to-be obsolete CDs) actually appears to be working! Digital music downloads jumped more than 50 percent in the first half of this year compared with the same time last year according to a recent Nielsen SoundScan report. Remember when the iTunes Music Store sold its billionth track after being in business for about 3 years? Well dig this: Only a year and two months after announcing its billionth song in February 2006, Apple announced it had sold 2.5 billion songs — meaning roughly 1.5 billion songs were sold in just 14 months. Now the major labels are getting greedy once again and trying to put the squeeze on the man who’s helping them survive the rapidly flagging physical album sales.